This week's featured teacher is Nikki from Teaching Autism. What have you taught? I work within an ASD unit. I have worked with Middle School age: 11 - 15 and now I am based within the foundation phase: 3 - 7. What is your favourite part about teaching? I am actually a Level 3 Teaching Assistant. I support the Teacher and help lead/run the class. It's quite common here in UK but not so much overseas. I support planning, evidencing, making resources, target setting, day to day running of class, communication, speech and language, etc. I love making new resources to help the children reach their potential and to continue to achieve new milestones. I enjoy liaising with others within the ASD sector and sharing new ideas. What is your best advice for a beginning teacher? Don't believe everything you read in a text book! Come into a class, form relationships/bonds with your students, get to know them; through this they will trust you. I can guarantee you will see better results if your students trust and like you. Please, always remember that every child is different; what works for one may not work for another. And last but not least, enjoy every moment of it! 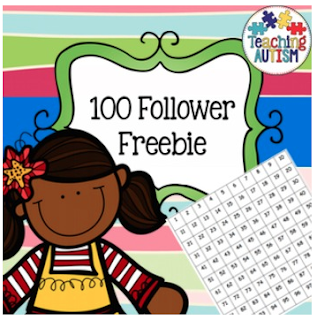 Nikki would like to share her 100 Follower Celebration Freebie from her TpT Store. You can download the file by clicking on the picture below. If you download this freebie, don't forget to leave Nikki some feedback for her generosity. You can do this by clicking on "My Purchases" and finding the download in your "Free Downloads" tab. Don't forget to check out Nikki's Teaching Autism blog for a peek inside her journey as a teaching assistant in the UK. Thanks, Nikki, for participating in this week's Teacher Feature!